Sustaining the perfect fit of jeans can be a real hassle. If yours are a little too loose or tight, looking into shrinking or stretching might help. Want to know how? Here’s your ultimate guide on how to stretch and shrink your denim. Jeans are both a simple and complicated piece of clothing. Simple, as an effortless wardrobe staple. Complicated, in the struggle to find and sustain the perfect fit. Jeans are essentially a two-piece equation. The first part is about looking at composition, style and fit and trying-on relentlessly, to find your ideal pair. After this tedious task, you'll have a pair of jeans which more or less fit well. Now it’s about denim care. Depending on how (frequently) you wash and dry, the size and fit of your jeans will change. A once well-fitting pair of jeans may become loose or tight in certain areas, most commonly around the waist and thigh. There’s also the issue of a changing body shape; what happens to your jeans if you lose or gain weight? Should you hold onto them just in case you return to your previous size? Should you get rid of them? Should you even get them tailored? Sometimes it might be worthwhile considering, should I try stretching/shrinking my jeans? If the answer is yes, here's how. Are your jeans too tight? Rushing off to shops to buy a few new pairs may be common practice, but it's not necessarily the best solution. It’s expensive and it's time consuming. 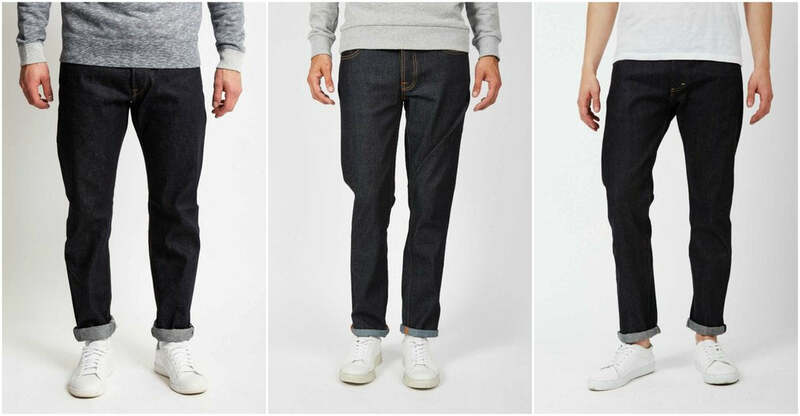 Depending on your problem area, we’ve compiled a list of some of the best ways to stretch out your jeans. Jeans fitting a little snugly at the waist is a very common male problem. Men’s waistlines tend to fluctuate. It’s a fact of life. Whether you’ve bulked up or you’re getting a little older, your waistline will get a little bigger, and the smallest margins can make your favourite jeans feel incredibly uncomfortable. You might even find yourself browsing the sale rails, and see a bargain you just can’t pass up. You say to yourself “it’s okay, they’ll stretch out over time”. Six months later, and they’re still cutting off your circulation. You need a lesson in stretching the waistline. Guys with big thighs can really struggle finding a new pair of jeans, even if yours are nowhere near Robert Forstemann’s size (Google him). Avoiding skinnier fits and looking for a little stretch will aid you in your efforts to find a good fit. If you find a pair you’re really keen on, and they’re a little tight on the thigh, think about stretching, please. Jeans which are tight solely on the thigh are not in the slightest flattering. If they're 100% cotton, they’ll also be rather uncomfortable. Check out these hacks on how to stretch your jeans’ thighs. Over time, your jeans may become just a little too tight in one area, or a little short as a result of washing. These solutions can be targeted to any area of your jeans. Raw denim (also known as dry or unwashed) is denim which is not exposed to the wash process. During the process of washing, the material tends to loosen up, making the jeans more comfortable. As raw denim is not washed, it tends to be a lot more rigid. Raw denim has to go through a period of ‘breaking-in’, which involves wearing constantly to create a natural wash and to stretch out the denim. At the end of the breaking-in process, the denim will soften and mould to your body, creating a comfortable garment. To speed up the breaking-in process and stretch out your jeans a little, think about cycling soaking and lunges. Regardless of wash, when stretching out your jeans, a number of considerations should also be taken into account. If you've stretched your jeans and they now fit well, try hand-washing and then hanging up to dry outside. Avoid tumble drying, it will inevitably cause your denim to shrink, maybe beyond repair. Also, bear in mind that if you cannot button up your denim, it’s time for them to find a new home, or go on a trip to the tailors. If your weight does tend to fluctuate, jeans with a little elastane (spandex), also known as stretch jeans, should be a go to. Not only are they more comfortable than 100% cotton jeans, they provide more 'give'. This means that they will be a little more forgiving if your waistline increases. Furthermore, as the name suggests, they will stretch more with the use of stretch techniques. When looking for a brand, you may want to check out Diesel, Calvin Klein, or Levi's stretch jeans. Whether you’ve bought a pair a size up (shrink to fit jeans), you’ve lost a little weight, or your jeans have loosened up with wear, you may want to look into shrinking jeans. Do jeans shrink easily, you ask? Yes they do. Shrinking denim is as easy as shrinking your bank balance or a ‘hand-wash only’ t-shirt. Let's look into it. Shrinking your jeans all over can be achieved through the application of hot water. 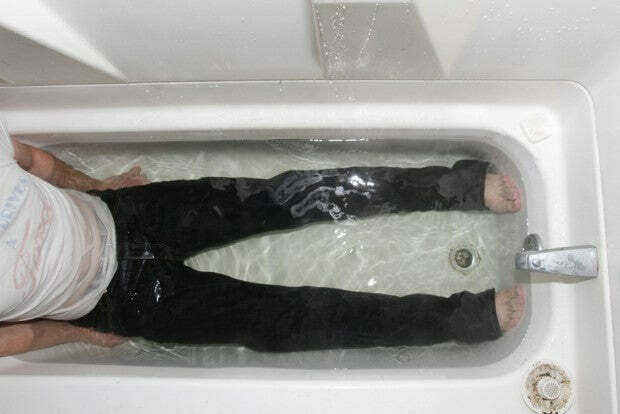 The heat of the water causes the fibres in the denim to contract, hence shrinking the jeans. There are a few methods to achieve shrinkage. Before you start, it must be stressed that when you're shrinking targeted area, be precise. Any wet part of the jean to go through this process will shrink, so be careful. The benefit of knowing how to shrink jeans, is also knowing how not to shrink jeans. Once your jeans fit perfectly, take precaution, and try to reduce washing. The constant process of shrinking and then stretching will be detrimental to the quality, and hence longevity of your denim. If your jeans are too big or too small, and you’ve tried all the solutions, it’s time to get rid of them. If they lack length, think about making them into a pair of shorts for the summer. If they're a lost cause, see if a friend wants them, donate them to a charity shop, pop along to a clothing bank, or recycle. It's now time to buy yourself a new pair. If treated well, a good pair of jeans can 'last a lifetime', or at least, a few years. If your jeans become slightly big or small, there is always the option of stretching or shrinking. Take great care when applying force or tumble drying, particularly if you're dealing with a well-loved pair of jeans. While we all want to hold onto our favourite jeans forever, sometimes they're past the point of redemption. If you've tried all the solutions, think about buying a new pair.